With the ever-growing technology day by day, we have seen various advanced email client applications. Lotus Notes and MS Outlook are two most advanced and widely used email platforms across various organizations today. Lotus Notes is a product from IBM whereas MS Outlook is an email client from Microsoft. A user working on any of the email clients always looks for an advanced set of features to successfully communicate within or outside an organization. However, such set of advanced feature are not provided by all the email clients. A user working on IBM Notes or Lotus Notes might experience some less features or could have a hard time getting familiar with the client application. In such a situation a user might feel the need to migrate to a different email client. MS Outlook is an email client, which is high in demand because of its upgraded set of facilities. There could be several other reasons for a user to migrate from one platform to another, in this case from Lotus Notes to MS Outlook. Both Lotus Notes and MS Outlook use a different file format to store user mailbox data. So, in order to migrate from Lotus Notes to MS Outlook, one needs to convert the data from Lotus Notes (NSF) file to MS Outlook (PST) file format. Since, these file formats are not compatible across other platforms, migration is not as easy as it looks. However, there are various rules and procedures, which can be followed to migrate from Lotus Notes to MS Outlook. But even such procedures and rules are not always feasible in successfully migrating from Lotus Notes to MS Outlook. Some of the most common issues faced while migrating from Lotus Notes to MS Outlook are mentioned below. 1. While migrating to MS Exchange Server 2007 from Lotus Notes, using the Transporter suite, you might get the following error. The Transporter suite can migrate emails within 4 MB of size. For emails having attachments of more than 4 MB size, this suite fails; hence, the attachments are left. However, this issue can be resolved by increasing the period of execution time-out and buffering threshold. 2. While launching Lotus Notes, you might get the following error message. bookmark.nsf database through Access Control List (ACL). However, you can resolve this issue by taking the Notes ID of the user to create all new bookmark files. 3. You might get the following error message, when you try to open the address book for IBM Notes. The above error message comes up if you have modified the database or due to the existence of different version of the INI file, as a result Lotus Notes fail to locate the Address Book. 4. If you go ahead and select a particular data type to convert NSF file manually, you could get the following error message. It means that the selected data type is not available for conversion. Hence, you would not be able to convert Lotus Notes data to an MS Outlook format. In order to overcome such a situation you can use a professional and reliable tool to migrate from Lotus Notes to MS Outlook. Stellar NSF to PST Converter is an efficient tool to provide a hassle free migration by converting Lotus Notes (NSF) files to importable MS Outlook files (PST). You can also try to use another software for NSF to PST conversion from here http://www.nsftopst.net . 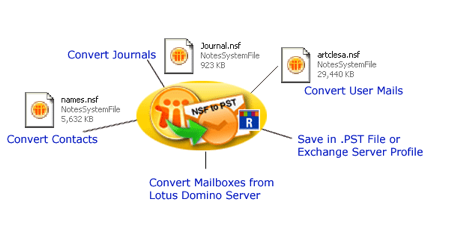 It is well known as Kernel for NSF to PST Converter that easily transfer Lotus Notes data to Outlook. this tool easily convert all Lotus Notes data to Outlook PST file format. transfer NSF file to Outlook PST file. I have offer code by which you will get 30% discount.